The American Society of Civil Engineers’ California Infrastructure Report Card Committee released a portion of the state’s scorecard months ahead of schedule to raise awareness about infrastructure and funding issues. California earned an overall C- on the portion of the scorecard released Oct. 3, which assessed bridges, transit and roads. Bridges and transit received a C-. Roads earned a D. The entire scorecard, scheduled to be released in February, will include 14 more categories. California Infrastructure Report Card Committee Co-Chairman John Hogan told Transport Topics that the group accelerated publishing scores for the three categories that may see changes in funding after the general election Nov. 6. One initiative on the ballot, Proposition 6, would repeal the increase in the fuel tax that was enacted in April 2017 as part of the Road Repair and Accountability Act. Also known as Senate Bill 1 (SB1), the act raised the tax for diesel by 20 cents to 36 cents per gallon, and gasoline was hiked 12 cents to 41.7 cents per gallon. The report indicates that about half of the state’s 25,000 bridges have exceeded their useful 50-year lifespan. According to the American Road and Transportation Builders Association, 6% of California’s bridges are structurally deficient. 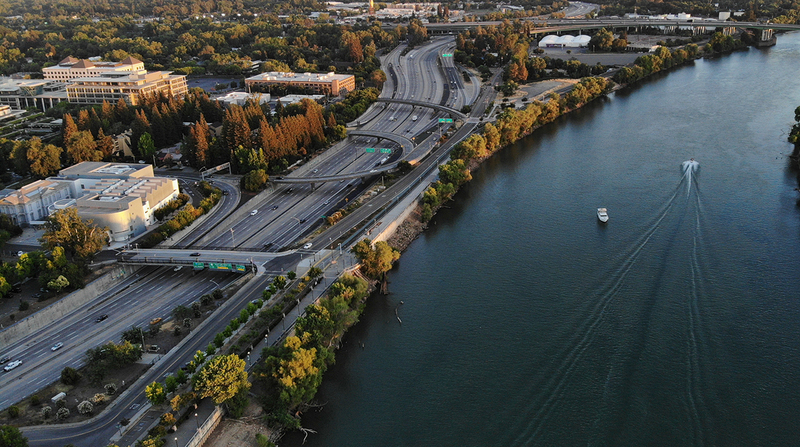 Certain bridges that carry major freight routes, such as Interstate 5 in San Diego and I-80 in Sacramento, require intensive repair and rehabilitation. California’s road system, which sustains a population of 40 million and an increasing vehicle-miles-traveled rate, scored the lowest on the report card. California’s deficient roads cost drivers $61 billion a year due to congestion-related delays. The junction between state routes 60 and 57 in Los Angeles ranks No. 5 on the American Transportation Research Institute’s 2018 list of the most congested freight bottlenecks. Hogan said that poor roadways exacerbate congestion and create problems for vehicles, including tire wear. This latest grade is down from the C that California received on its previous scorecard, which was issued in 2012. The last report card evaluated eight categories: aviation, drinking water, levees, ports, solid waste, transportation, urban runoff and wastewater. The report card’s most consistent recommendation advises constituents to vote “no” on Proposition 6 during the general election Nov. 6. Revenue from the increases, a projected $54 billion over the next decade, is to be invested in such projects as load-bearing improvements to bridges carrying I-5 in Sacramento as well as pavement preservation along I-10 in Riverside. SB 1 is slated to provide $4 billion for bridge projects and $52 billion for roads over the next 10 years, according to ASCE’s report card. Repealing the fuel tax increase included in SB 1 would mean deleting, delaying or downsizing 50% of projects earmarked for funding, California Department of Transportation spokesman Thomas Lawrence said. Shawn Yadon, CEO of the California Trucking Association, said the funds made possible through SB 1 have been put into valuable road maintenance and rehabilitation projects. He said he hopes the funding will not be hamstrung by the passage of Proposition 6.